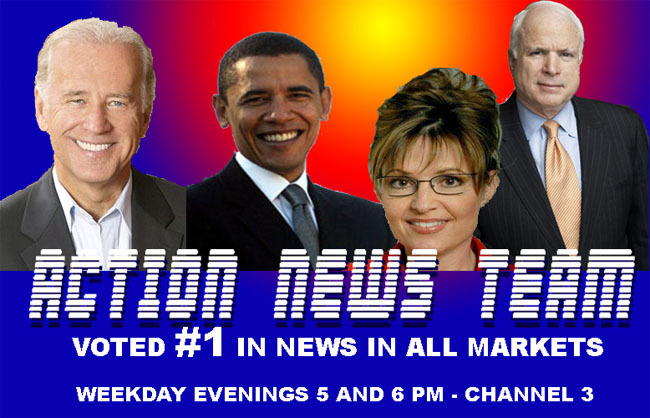 McCain, Palin vs Obama, Biden – Action News! Wow – what a week. America has nominated the finest looking news team ever! photoshopped in a rush by mark wiberg. so Obama takes the stage and says to the 80,000 people in attendence: “Build me an army, worthy of Mordor….” then he’s all ‘gotchya!’ and goes into how he wants to save the world, when we all know that if he just saves the cheerleader, he can do that. And he goes through his list of things to get done – his “Honey Do” list, as it were, only it’s more than fixing the goddamn sink or mowing that dead patch of weeds you call a yard. No, he’s got world peace, the economy and the big digital television changeover in February to worry about. DNC, night 3, Clinton, Biden, and Obama, MSNBC, part 3! So Obama shows up at the end and says ‘thanks, Biden, for remembering my name.’ Then he takes out a coin and tosses it to Biden, and says “Keep the Change” and he winks knowingly and they fist-bump, only Biden breaks his hand and starts to cry so they take him off stage. And then Obama gives a shout out to Bill Clinton, who will not be the First Man next year, but instead will return to NY to continue his studies of global politics and solutions to poverty, and to catch up with E!’s show “Girls Next Door.” Then Obama waves to the crowd and Fox News reports that Obama whispered “dirka dirka” to Biden earlier, proving once again that Obama lives a double-life as a muslim, speaks muslim, and that plans for a White House basement-level mosque are in the works. Meanwhile, the dolts at MSNBC seem hellbent on destroying each other while “reporting/analyzing” the Democratic Convention this week. Olbermann, Matthews, Scarborough, Shuster, etc. are hilariously dysfunctional. It’s like that scene from Reservoir Dogs, with Steve Buscemi telling everyone to act like professionals. MSNBC needs a professional reporter to babysit all of them. I wonder if this kinda crap would be going on if Tim Russert were alive? So, here’s an example of the lovefest at MSNBC. Remember these people work for the same cable channel. I guess Olbermann’s “Worse Person In The World” will be sourced from within soon. It’s great television, though useless for the voters! (as usual, right?). So Hillary Clinton gave her speech today and is all ‘go ahead and support Obama, see if I care,’ then Bill Clinton stood up and wagged his finger at everyone around him and then stormed out. 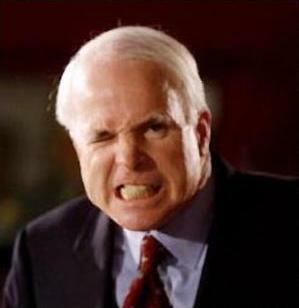 Then James Carville could be heard hollering “get ’em!” and then Hillary revealed secret documents that showed Obama is a muslim, the top muslim of the entire world, and a terrorist, too, and a bad daddy and even badder half-brother and then everyone in the convention center took a vote and replaced Obama with Hillary, and Michelle O was okay with it because she wants to go back to practicing law. Hillary cried and thanked the crowd. The end. Boring but that could just be the post-Olympics depression. Where’s Bob Costas? Ted Kennedy – dead man walking. No other opinion cuz I’m tired of the Kennedys. Ooops – I guess that’s an opinion. Michelle Obama – nice, but boring, but her kids were amusing and real.